Anne Morrow was a shy college girl who dreamed of being a writer. Charles Lindbergh swept into her life in his airplane and the two found a connection that surprised them both. They were swiftly married and she became Mrs. Charles Lindbergh. She learned to fly, which was remarkable for a woman of her day, when “aviatrixes” were even more rare than they are today, by far. They traveled the globe, flew together, took on world record challenges, and her life was anything but dull. When Anne gets pregnant, however, strain comes into the relationship. Anne’s nesting instincts kick in, and her availability to trot the globe with Charles becomes limited. She quickly begins to see a new reality about what it’s like to be “The Aviator’s Wife”. This famous family is most widely known for the kidnapping of their first born baby, and the The Aviator’s Wife tells a version of that story, but more than anything it tells the story of the relationship between Anne and her celebrity husband from the moment they meet until the moment of his death. The truth about the man, as a husband, as a father, all flaws exposed. Secrets about Charles Lindbergh came out years after his death, and those secrets are exposed in this novel that carries you through the perspective of his wife through everything they encounter, including time spent in Nazi Germany and much more. 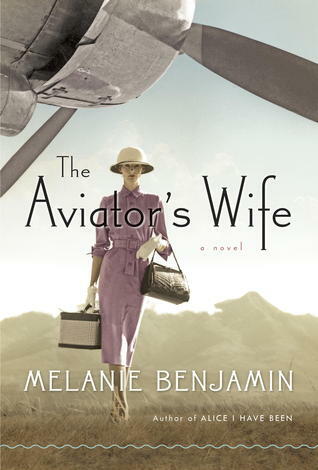 If you like to read novels about famous celebrities in history, The Aviator’s Wife , by Melanie Benjamin, is not to be missed. The audiobook format of the novel is also excellent. Great review! Thank you, I HAVE to read this!